When the bamboo growing at thirumalai itself has become desirable, is it necessary to say that emperumAn who is residing there, is desirable? AzhwAr mentions the way by which emperumAn protects his followers. He says “Won’t you realise that there is no space for him to measure?”. viN Aru alambiya sEvadi pOy – the divine feet which have been cleaned by AkASa gangA, reach out to. We can also construe the meaning as – the divine feet which have been touched by AkASa gangA, reach out to. pulambiya thOL eNdhisaiyum sUzha – the divine shoulders which are praised by all the worlds “How beautiful these shoulders are”, permeating in the eight directions. Just as mentioned in vishNu dharmam – mAngalya sthOthram “sangais surANAm dhivi bhUthalasthais thadhA manushyair gaganE cha kEcharai: sthutha: kramAn ya: prachakAra sarvadhA mamAsthu mAngaLyavrudhdhayE hari:” (let that hari who is worshipped by the dhEvas (celestial entities) in svarga (heaven), by the manushyas (humans) on the earth and those who wander around in the skies and who graced with his divine feet, bless me for my growth), he is worshipped by celestial entities in large gatherings. vaNduzhAy mAl aLandha maN idam pOdhAdhu enkolO – emperumAn who is decorated with thuLasi garland. 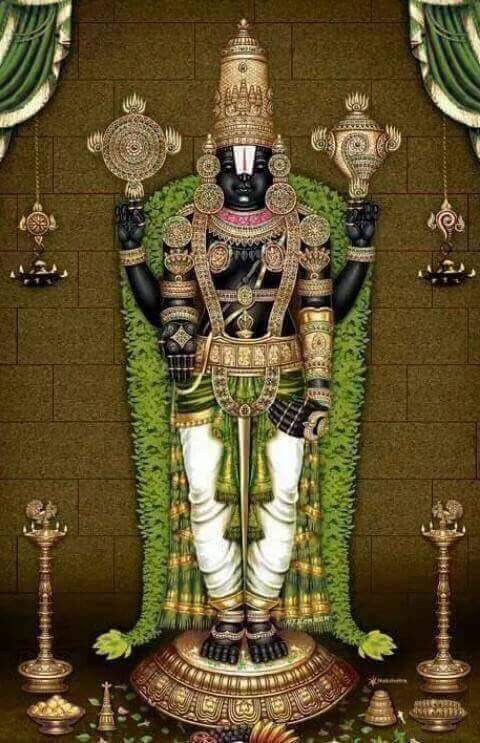 The emperumAn whose thuLasi garland gave out his wealth. Since there was no further space to measure, AzhwAr is wondering as to how he measured. He is amazed that while there was no space to stand and measure, how did emperumAn measure. One should have arranged for the space to be measured. Without doing it, how did he measure it, he is wondering. We will move on to the 91st pAsuram next. This entry was posted in iyaRpA, mUnRAm thiruvandhAdhi on June 3, 2018 by T N Krishnan.